The Earthdance kitchen is well-equipped to serve large groups, with an industrial range, dual ovens, ample counter space, and adjacent walk-in refrigerator and dry goods pantry. We offer several food prep options to suit your needs. Our Earthdance Chef prepares sumptuous vegetarian cuisine using organic, fresh, local produce whenever possible. Hearty soups, crisp green salads, home-made breads and fresh-baked deserts often compliment meals. Wheat- and dairy-free diets are accommodated. Other options may be available, give us a call. 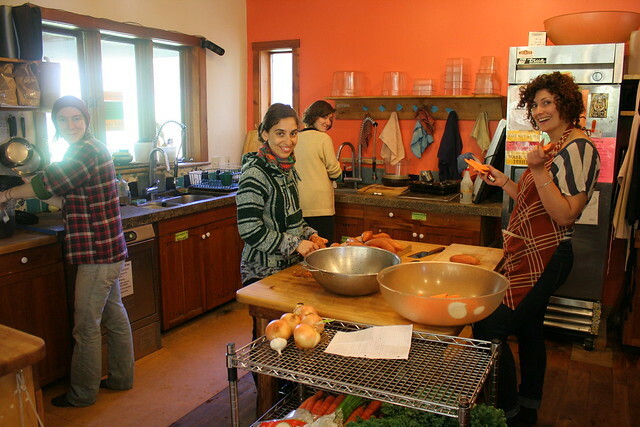 Earthdance provides full use of the kitchen facilities and food from our well-stocked refrigerators and pantry. Special ingredients can be requested for your time at Earthdance, but not all requests can be accommodated. We provide three delicious meals each day during most events. Snacks (fruit, bread, rice cakes, nut butters) and tea (a wide variety) are are available 24 hours/day. During our own events, Earthdance serves delicious vegetarian meals that are as local and simple as possible. Dairy-free and wheat-free diets can be accommodated, however please do let us know in advance. If you have other food allergies, please bring supplementary food for yourself as you deem necessary. (You may see residential staff preparing meat. If you'd like meat, we recommend the Old Creamery Grocery, up the road, where you can purchase and consume prepared foods, including meat – we generally do not allow guests to cook meat in our kitchen, but you can be in touch with our Executive Chef, at executivechef@earthdance.net to make other arrangements). If you are attending an event that is not sponsored by Earthdance, meat may be served – check with your workshop coordinator to find out what food will be provided. If you are on personal retreat, you may be responsible for preparing your own meals, using food from the Earthdance kitchen (vegetarian items). If you want to bring supplemental food along with you, we have a shelf in our walk-in refrigerator and shelves in our pantry where you can store it. During meal preparation times, we will ask that you stay out of the kitchen so that the cook can focus on preparing meals. Earthdance tries to build relationships with local farmers and other local food producers. Currently, items such as honey, maple syrup, yogurt, melons, berries and onions come from local farms. During the summer, even more of our produce is available locally.